We arrived back from Norfolk at the weekend, oh how I wish I was still there! It couldn’t have been more perfect, glorious weather (apart from one afternoon of rain), lovely places to visit, early morning walks on the beach with Murphy my Irish Setter, plenty of opportunity to make the most of my recent Canon 50D purchase and excellent food/food shops galore – now just what more could a girl want from her holiday? I think this is the time to share a few (non food related) holiday snaps with you before I launch into the full foodie delights I must (I feel duty bound) to share with you all. Every little village we visited had an outstanding selection of food shops, now why can’t my local area be the same? I’m obviously aware that not every village in Norfolk is as lucky either but I just seemed to be blessed with such an array of good, local produce. Locality and sustainability seemed high priorities for all shop keepers and local stall holders alike; from the fish mongers to large stores like Big Blue Sky (who only sell produce from Norfolk) it seemed to be second nature to follow this principle, and, that is something I very much admire and try to adhere to myself. 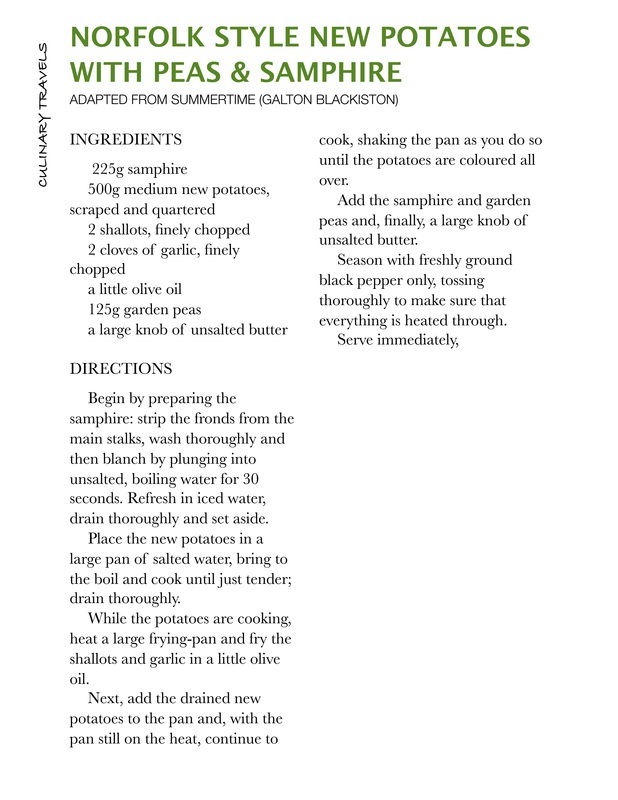 Amongst many other goodies were some lime honey and Summertime by Norfolk born chef Galton Blackiston; it was these two items that, along with a pot of crab from Blakeney, and a bag of samphire from roadside stall, inspired our first proper meal on arriving home. 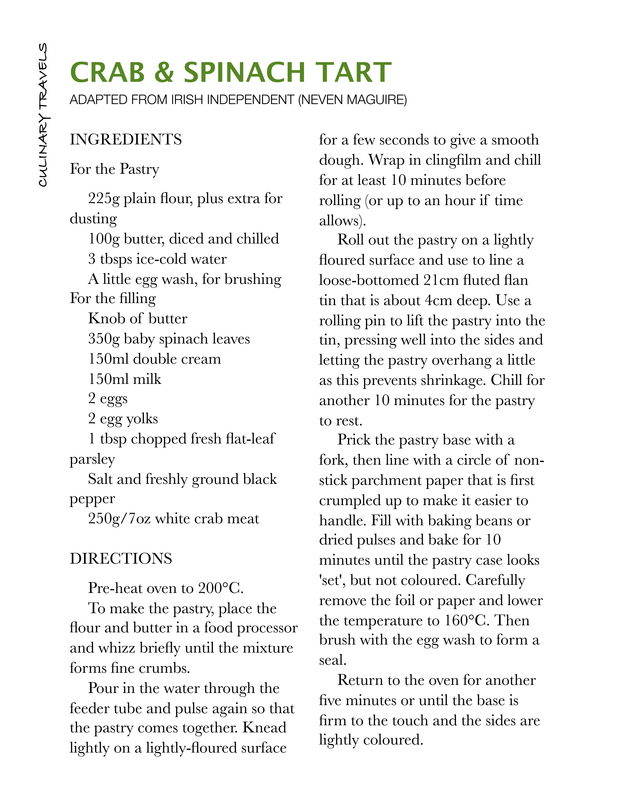 The crab from Blakeney was bought at Weston’s Fish Shop, a place that made me long to live near the coast. I bet you’re wondering what I did with some lime honey, samphire and a crab now aren’t you? Well I made a quivering, rust-coloured tart of such delicate flavour and nature that allowed for the smell and flavour of the sea (for that is what crab is to me, the sea in food form) to permeate the kitchen and my eagerly awaiting tastebuds, with a side serving of new potatoes and samphire. The recipe for the tart is an adapted version of a Nevin Maguire recipe which I found a short while ago in the Irish Independent. I replaced the smoked salmon with extra crab meat, plus a handful of baby spinach from the garden; and the chilli sauce was replaced with the lime honey (to add a hint of sweetness and citrus tang) and I didn’t add the chilli flakes to the pastry either; I really didn’t feel any ‘heat’ was required and did in fact think that it may ruin this dish should it have been included. 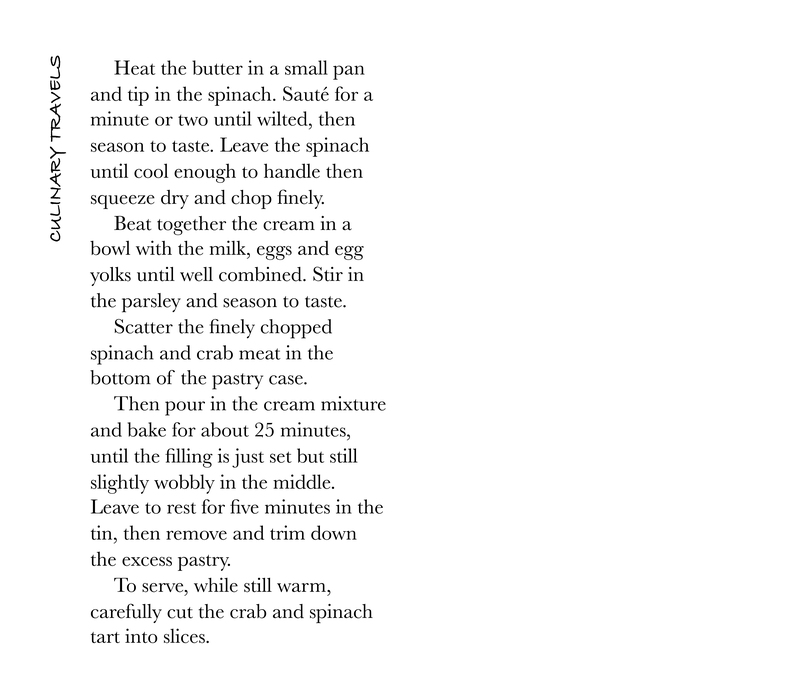 The inclusion of spinach gave the dish a sweet earthiness which really complimented the crabs flavour. The tart really was a real success and was even good served cold (and that is coming from a person who doesn’t normally like cold eggy dishes), when the flavour of the crab became even more pronounced but it is well known amongst foodies that crab meat, especially white meat, is immensely improved by being served chilled. I did contemplate adding some samphire to the flan but I’m glad I didn’t, I think it would have made the flan just ever so slightly over salty but as an accompaniment I can think of nothing that would suit this taste of the sea any better. So how does Galton fit in? Well his contribution is the potato and samphire side dish. As per normal I did adapt the recipe slightly, leaving out the bacon and changing the soy beans for garden peas. Why the changes? I didn’t have any bacon or soy beans so had to improvise. The inclusion of bacon would be fabulous, providing it was a sweet cure variety; this would be needed to offset the samphires salty nature; the bacon would compliment the crab too I’m sure. As for the soy beans, I don’t much care for them so not including them was no hardship. If you’re ever in Norfolk don’t forget to stop by Big Blue Sky or to buy some fresh seafood! My freezer is certainly well stocked up.